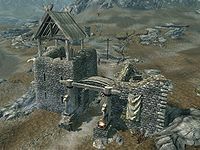 Whitewatch Tower is a small tower just northeast of Whiterun occupied by the guards of the city. To find Whitewatch Tower on your map, look just northeast of Dragonsreach. If you're having trouble, try looking east of Halted Stream Camp and west of Shimmermist Cave, as it is between these two locations. Whitewatch Tower is an open-air, frontier lookout post. As expected, wildflowers grow freely, including blue, purple and red mountain flowers, and lavender, at what would have been considered the entrance of the ruined keep. A stone quarryHF is on the southside of the tower, behind a stone wall outcropping. In the courtyard of the tower more lavender is growing. There are some meager provisions for the guards just to the left of the entrance arch. A novice-locked chest among the crates holds more substantial treasure. A weapons rack is on the south end of the courtyard, under a tree. It holds two Imperial swords and a leveled sword, or else an iron war axe, matching battleaxe and leveled mace should the Stormcloaks take over the hold. The wooden ramps lead up to the watch tower and nothing of interest. However, jumping onto the ledge on the west side of the tower, behind the guard's chair, and crossing over the archway takes you to the ruin of the west tower. Buried in the rubble is an apprentice-locked chest. Caution is advised when unlocking the chests around the tower—if the guards see you, you will receive a bounty. When approaching the tower for the first time, it be will under attack from a small group of bandits. There's a small leveled strongbox which is easy to miss to the northwest, between some stone blocks on the top of a hill. 1 Iron Ore and 1 Silver Ore veins are located 250 ft south of the tower, at the base of the Dragonsreach hill. 1 Gold Ore vein is located 410 ft south of the tower, up the hill. Just to the east of the Gold Ore vein is a leveled novice-locked chest. There is a bandit camp located within a shallow cave southwest of the tower, at the base of the hill that Dragonsreach sits on. It is occupied by leveled bandits, and has a wide variety of loot, including alchemical ingredients, weapons, potions, and the pickpocket skill book Aevar Stone-Singer. A cookpot and a horse can be found here as well, although the horse must be stolen to be ridden. This page was last modified on 7 January 2019, at 05:34.